SAP Cloud Platform is an essential ingredient of SAP’s digital strategy. It is the platform for our customers’ and partners’ transformation journey towards digital business models and thus is of utmost importance for SAP. And so is security in SAP Cloud Platform! On the road to digitization, strong partnerships have become a key differentiator. Managing identities and access is at the nucleus when enterprises move their businesses into the cloud. Consequently, it was very clear that the SAP Cloud Platform Identity Authentication service and the Identity Provisioning service are the pounding heartbeat of connecting with Google! The integration with Google allows customers to choose the best combination of tools to run better. Identity Authentication allows employees to use their Microsoft Active Directory credentials to reach cloud applications without the need to remember yet another password. In case they access the application from their corporate network, they can even sign-in automatically without specifying any credentials. G Suite or Google Cloud Platform, and grant their users access to any application, from any device, at any time. Many SAP employees already benefit from this scenario in a different context. Sharing files or collaboratively working on a presentation or a spreadsheet has never been easier. Since April, Microsoft OneDrive is available for all SAP employees worldwide. You can think of it as the ‘My Documents’ folder in the cloud. OneDrive files are private by default, but sharing them and co-authoring with others is easy. And it really works! Across platforms, across devices, from anywhere. You sketch an idea in Word on your iPhone while you commute to work, continue at your desk, later simply share it with a colleague to jointly work on it during your Skype call. And under the hood – SAP Cloud Platform Identity Authentication and Identity Provisioning. Google, Microsoft, and SAP – strong partnerships that make a difference. Supported by SAP Cloud Platform. 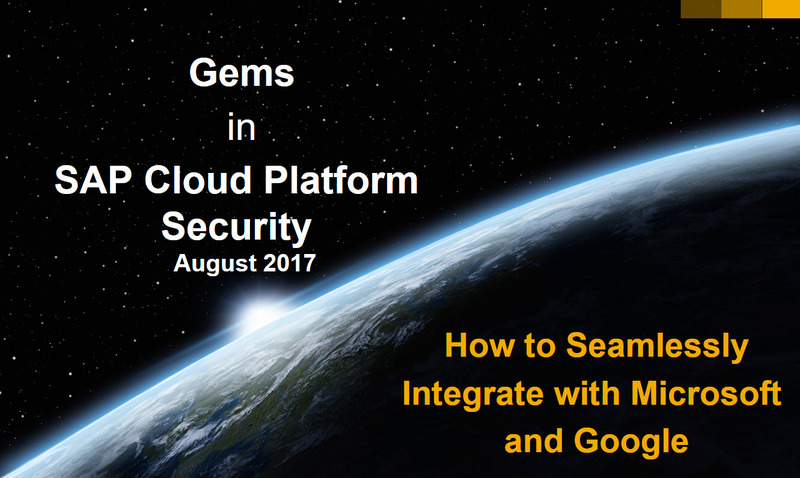 “Gems in SAP Cloud Platform Security” is a new series of blogs. It takes you on a tour to discover how security is seamlessly woven into the success of SAP Cloud Platform. Hi Hartmut, thanks for the post. This all sounds very exciting, but this excitement is dampened somewhat by the fact that early adopters won’t be able to help with traction as we don’t have access to the Identity Authentication service in our trial accounts. Can you please shed some light on whether this is planned? Without access, I fear that knowledge and the sharing of experiences will be limited. Hi, currently I’m not aware of any plans of having this service in the trial. As a partner, you can gain access to a trial instance of the SAP Identity Authentication through your Sales Rep. You can find some knowledge on SAP Identity Authentication on the SAP HANA Academy as well as on SAP Help Portal. Thanks. That’s an awful lot of friction for many folks. Is there a reason for this? To put things into context, I use my personal trial account to learn about service offerings as that is where I do other stuff too … and while it’s currently not possible to switch accounts on the fly, my partner account doesn’t get much of a look in when I’m investigating. It’s a shame, I think there could be a lot of individuals interested in learning more and helping push this service, but it won’t happen unless they can tinker with it first hand.